(Translation) BBC: Global warming is leading to catastrophic consequences for the world’s tropical glaciers and the communities and ecosystems that depend on them, as shown by this example from Peru. “I first came to know this glacier when I was 14 years old, and it was an astonishing sight, a place one visited to climb onto the ice and play sporting activities”. 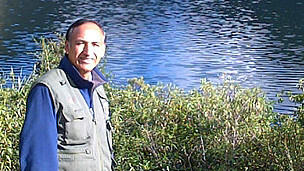 The engineer Ricardo Jesús Gómez López is manager of Huascarán National Park, home of the Pastoruri glacier, in the central Peruvian Andes. 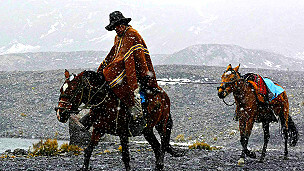 During the 1990s it was a wintry oasis that attracted some 100,000 tourists each year. 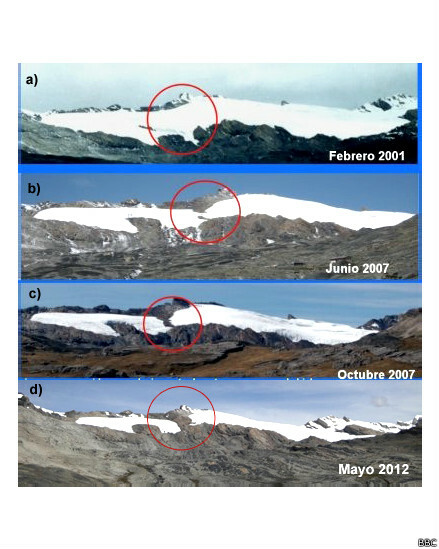 Yet global warming has hit Pastoruri hard and in the past two decades the size of the glacier has shrunk by about half. “It’s fairly exposed, and the retreat you see in this type of glacier that is unprotected by surrounding mountains is much more rapid”, explained Gómez López to BBC Mundo. “In 2007 it split in two and last year another chunk of the southern part of the glacier broke off; now it’s a glacier divided in three”. 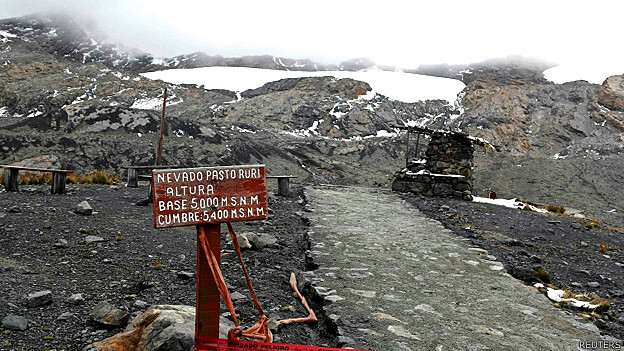 Despite the changes, the park’s authorities believe that members of the public should continue to come to the glacier, although for somewhat different reasons. Pastoruri will be the centre of a new “Climate Change Trail”, which promises to offer visitors a unique experience: witnessing up-close the irreversible impact of global warming and having a chance to see the glacier before it disappears, something which could come to pass in little more than a decade’s time. The plight of Pastoruri doesn’t just represent a loss for the local population dependent on tourism: glaciers also serve as reservoirs which provide water for rivers downstream. “If we don’t show awareness now, what worries me is that not only will future generations be deprived of the opportunity to see a snow-capped mountain that has come to be an icon of Áncash Department (where Huascarán is located), but we are also going to have problems with water supplies”, according to Gómez López. Some local residents have tried to insulate the ice with sawdust in order to slow its rate of melting, in addition to painting the newly-exposed rocks white so that they might reflect the sun’s rays back into the atmosphere. However, none of these actions have been able to halt the unyielding depletion of Pastoruri. “You would need to cover a huge surface area with sawdust or straw, and the costs of doing so would be extremely high, so they’re not appropriate measures”, said Gómez López. “There are other more important things that we need to do to adapt to the decrease in water resources in the future”. He estimates that in Huascarán National Park alone, some 700 glaciers are shrinking at various rates; all this in Peru, a country that is home to around 70% of the world’s so-called ‘tropical glaciers’. “The reduction of glacial mass obviously means a reduction in the availability of water for communities who live downstream”, notes Gómez López. “The glaciers in our region play the role of normalising the flow of rivers, especially during the dry season. If the glaciers shrink then we’re no longer going to get the amount of thawing that there would normally have been”. The process of glacial melting in itself also leads to metals in the newly-exposed rocks, such as iron, becoming detached and entering streams, which has an impact on the quality of the water by turning it acidic. In the view of Gómez López, it is essential to work not just in reservoirs but also in “sowing water” – reforesting areas around the headwaters with native trees that have the capacity to retain water. “Meadows are also ecosystems which play a similar role in retaining water, all these ecosystems are vulnerable. In the case of our park one can list mining activities, which pose a real threat to river sources and watersheds, as well as overgrazing by communities living within the valleys of the river basin”. Furthermore, he suggests that there should be initiatives to offer alternatives to the communities and encourage them to carry out their livelihood activities outside of the headwaters of Huascarán. “There are other measures which will need to be taken in order to prepare ourselves for a future with less hydrological resources, such as restoring rivers that are highly contaminated. The River Santa (Río Santa) is one of the country’s most polluted rivers, due to mining and the fact that the communities placed alongside the river don’t have water treatment plants at their disposal”. The number of visitors to Pastoruri was barely 30,000 last year. The decrease in tourist arrivals has affected local vendors who let out shelters or sell food. “Before, I would sell 30 or 40 meals each day”, Nelisia Tuya told Spanish-language newswire Efe while stirring a yucca and lamb soup. “Now it’s only two or three, five or six on a good day. And even that’s with fewer of us around who are selling things”. Other locals of the nearby community of Catac have already abandoned their homes and upped sticks in search of jobs in other cities. Could Pastoruri continue to attract tourists? For those who are driving the “Climate Change Trail” initiative, which will be officially launched in March, the glacier has at its disposal one great advantage: its easy access, with an hour’s flight from Lima to the regional capital of Huaraz followed by another hour’s drive from there to the slopes of Pastoruri. From the point of view of the park’s management, the glacier is perfectly placed to show the world the growing impact of global warming and climate change. “It’s important for academics, students, families, the population at large, to have the chance to witness here how a glacier is losing its mass, so they can clearly see how there is a lagoon forming and growing year by year due to glacial retreat”, said Gómez López. “It is of utmost urgency that decision makers, those who are in charge of the destinies of the world’s populations, become aware of these facts and that they work on specific projects that allow people to have a better understanding of the rational use of water”.